The parents are visiting for the weekend but since the seventies, Saturday evening for them has always been about TV talent shows – New Faces, Opportunity Knocks, Stars in Their Eyes and this evening it’s Strictly and X-Factor. My TV set has never been so abused. I’ve had to look away, despite all the glamorous ladies in gorgeous dresses. The La Sportiva beginners shoe that I’ve been climbing in this year finally procured a hole in it’s rand, courtesy of the roughly textured paint at the Pinnacle climbing centre, 4×4 training and my flawFUL footwork. A quick scout around the centre and it quickly became apparent that the Bandits are popular, both in the bouldering room and on the competition wall. Nothing’s easy however and I fall between sizes stocked and have to wait a couple of days for Simon’s next delivery. Pinnacle are an Evolv Performance Specialist centre and whilst the Shamen may suit Sharma, I’ve a feeling that the Bandits are more than good enough for the climbing I do. A couple of boulder problems and it was obvious that they fit – pain. Being maybe 20mm smaller than the Sportivas, my toes are always going to feel cramped. I was liking the stable platform mind, edging felt way easier and in my mind I was dreaming of slate routes again. A few NLMC members were off to the cottage for what looked like a decent weekend weatherwise and I ask Dale if he fancies coming along for a bit of trad. Now Dale climbs way harder than me, even when he had a broken leg last year and he’s been big wall climbing in Yosemite – he’s also seen my poor attempts at Pinnacle. We’ll make a great team obviously. The others decide to head to the Pass with it’s history and mountain routes whilst Dale and I, Team Northampton, head to Gogarth, ignoring possible rain forecasts in return for seacliffs and quartzite. 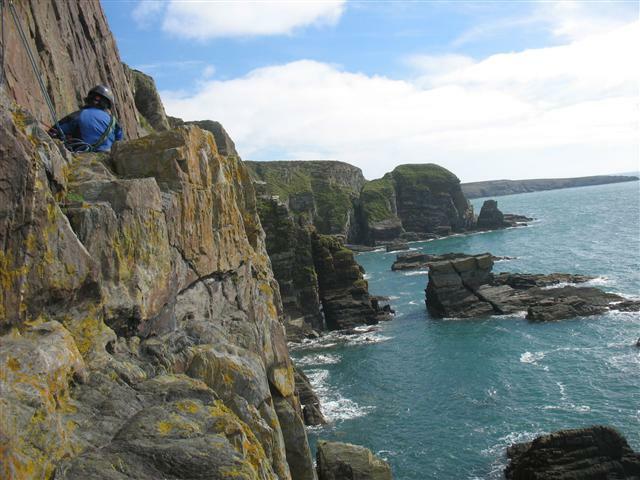 Anglesey isn’t new to me, I’ve climbed on Holyhead Mountain more than once and I actually like the rock, however sea cliff climbing would be new to me. I’d once abbed down to the start of Commando Ridge at Bosigran with my lad but he got nervous and we scrambled back up. My turn to be nervous as Dale fixed the abseil rope and I stuck the velcro down on the new Bandits. ‘Man, they hurt’ and then it was my turn to follow Dale over the edge. The nerves washed away as the sea came nearer and the odd splashes of rain we’d felt in the car park disappear along with the cliff top. 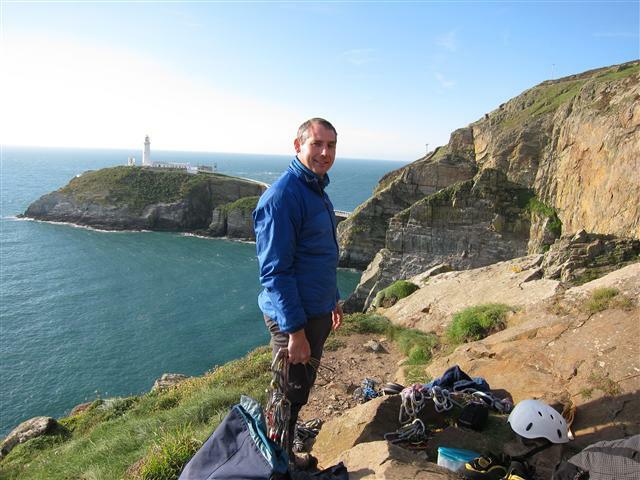 This was Gogarth South Stack and the first climb was to be Lighthouse Arete VS 4c – Dale asked if I wanted to lead the first pitch, a traverse of Severe grade but having never seen a traverse pitched properly, I felt I might learn more from seconding. Soon we were stood at the top, drinking water and having a few bites to eat and I was enjoying Gogarth. Atlantis was next, or rather the first pitch and this was a whole step up in climbing trad for me. HVS 5a, a corner that was vertical and the sea was coming in, utterly oblivious to my existence and it added a touch of spice to the climb. Dale had made it to about halfway and someone decided to abb down the route, no dramas, they couldn’t see him from their position and a few shouts and gestures soon sorted the situation. My turn. I was glad of the Bandits, the footholds seemed small, as did the holds. I had disco leg. A word with myself, sort the foot position and it was gone, crisis over. At the belay ledge I breathed deeply and felt like I’d actually climbed properly for the first time, in control and never wondering what the hell was I doing there. At that moment nothing else mattered, just me, my new shoes, a new climbing partner in Dale and of course the star of the show… Gogarth. 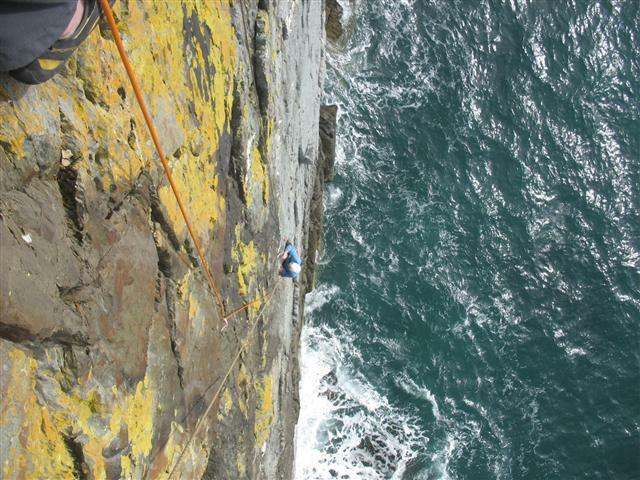 Abbing back down from the halfway belay ledge to do the first pitch of Northwest Passage, I leant out to abb down and realised someone was getting onto the top of the rope – the cliff was getting busier and it was wise to keep your eye on the ball. Down I went, up Dale went and I followed. It was about now that I realised I may have struggled with the climbing if I’d have been using my old shoes, as they were too soft and flexible to grip to the, at times, tiny edges I was trusting my feet on. 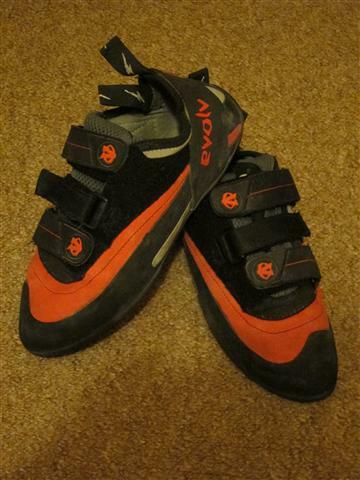 The Evolvs are meant to be a fairly comfortable shoe in Bandit style and whilst they were causing more pain than I was used to, the gains to be had more than made up for any discomfort. The red matched the zips on my trousers, style to outstrip Westwood. We sat on the belay ledge holding conversations with randoms and Gogarth captured my heart. I used to surf a few years back, and spent more than a while playing on a jetski and following a motorboat on a ski or two. Water meant a lot to me in those days and here I was, waves crashing, sun shining, chatting climbing. Content? Never more so. I did wonder how little old me, the young lad from Oldham who dreamt of being an astronaut and climbing Everest had ended up here. Content I was. My feet however were not. Ouch. I watched a climber head out on an E2 traverse, sketchy it looked and Dale said he fancied climbing that one day as he’d not been on that route. Quickly, now the climber had moved off, we set the belay up and Dale lead cleanly across and then up the E1 5b pitch of NW Passage. Now, I’ve been on and followed on E1 before but this was vertical and had a bit of a traverse, in other words it wasn’t a soft touch with me not being the stongest of climbers. In my head I repeated over and over to myself ‘trust the feet and climb with them’. Some of the gear took an age and an effort to remove, DMM offsets are not a second’s best friends. but I never sat on the rope, pulled on the gear, slipped or felt out of my depth. The hand traverse was dispatched without fear and tiny foot placements felt as secure as a step. Thank you Evolv, my new Bandits cut the mustard. Dale was happy enough, happy with the weather, the climbing and me I guess. Enough to ask if I fancied seconding the E2 and whilst I knew I was climbing well enough, we’d climbed maybe 180m of mostly vertical quartzite and I was pushing my limits, not knackered yet but I couldn’t be far off. The offer was declined but it won’t be forgotten. We wandered round to have a look at Dream of White Horses, a classic climb if ever there was and it looked every bit a 3* route. My Bandits? They’re still a torture instrument but are wearing well at the wall despite my shoddy footwork and even tho I’ve had the Sportivas resoled, I won’t be going backwards. More on the Evolvs as the time passes. I’m not sure one night’s sleep should count as a review but it was certainly more than a first fondle. With me turning out to be a regular catastrophe when it comes to getting a decent night’s kip out in the mountains, I was happy to have the chance to experiment… like most of us, I’ve made mistakes with kit purchasing and it’s cost me dear. Looking at a dozen or so Big Agnes bags, my gaze fell on one that had a compressed volume pretty similar to my PHD Minim 300 and that’s a top quality down ball of fluff that weighs just over 700g with a full zip. There’s only so much you can fit in a rucksack and size matters – the Big Agnes Encampment packs small, so imagine my surprise when Ollie declares it to be synthetic! What magic is this? How could it be so small? About the only question I asked was ‘how cold will it go?’ Both the Insulated Air core mat and the bag were rated to -9c, I pounced and both items were carefully placed in The Villain. I have a bit of a regime nowadays in winter, learnt from others and by experience. 1 – Get into bed warm. The bag will only retain heat, not create it. This has seen me doing star jumps from time to time on a lonely hilltop. 2 – Eat late. That way your body is kept busy for a few hours processing that three course meal you’ve whipped up in the Jetboil. A busy body is a warm body. 3 – Make sure your bag doesn’t touch the sides of the tent, it often can at the feet end. If it does, throw your waterproof over your tootsies, as a wet bag can make for a very miserable visit to the small hours. 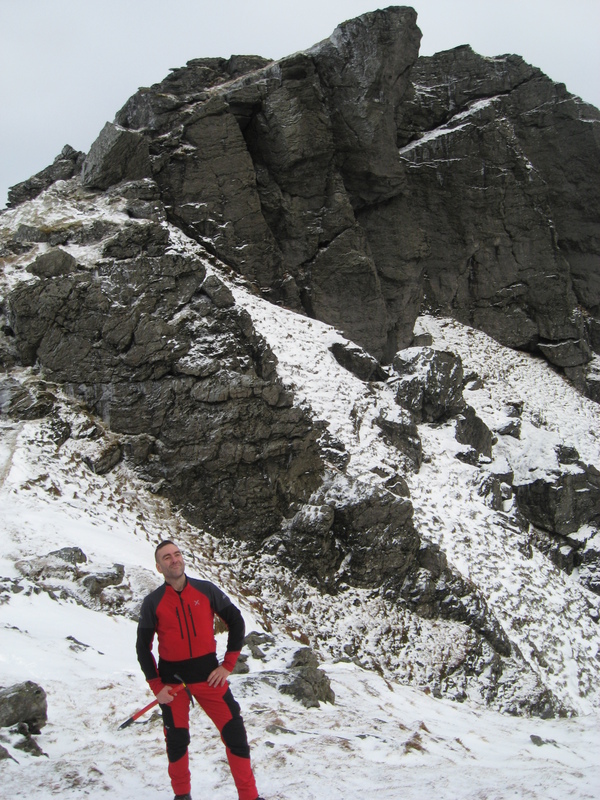 But you all know this anyway – what was the Big Agnes kit like? The tent, a Vango Helium 100, was erected in howling winds, sub zero temperatures and on a fair few inches of snow. The mat came out first, 680g for a full size, 2.5 inch pad. Impressive, it contains Primaloft Eco too. I own an Exped Downmat and a Synmat by comparison, this packed small and felt sturdy but the rating was lower at -9c and Big Agnes call it a three season pad. The Encampment was next and I finally realised why it had packed so small – a top bag! A new experience for me then and one I would never have considered if I’d been laying down hard dollar. It was too cold for faffing about and the mat was promptly placed into the lower sleeve of the sleeping bag, bent into the tent and promptly sat upon. Time for a good nose at what turned out to be a top piece of design. The lower sleeve would take an Exped, Thermarest or any other 20in mat, so if you’ve already spent good money on what’s below your back, there’s no need to change to the Insulated Air Core from Big Agnes. The bag itself was pretty voluminous, certainly around the chest and head, it had plenty of room to pull your knees up and this was quite novel. It dragged me back to camping holidays with my parents were sleep was attained in cotton rectangular bags. There was a built in sleeve for a pillow, Big Agnes do one but I just stuffed my waterproofs in there. It cinched up well around the neck without the usual feeling of ‘get me out of here’ and I was looking forward to clambering in it a few hours later. I then ignored my regime and broke all the rules. I ate early, I stood around chatting and pottered to bed freezing. Idiot. The tent was way too small, ridiculously so. Head and feet pushed against the inner and my waterproofs were being used as a pillow, I’d normally use an Exped Air pillow. It was a long cold night and I couldn’t even make a brew as the porch was far from big enough to safely use my remote stove and the internal guys were needed to keep the tent standing in what was turning out to be a bit of a hoolie. It was -5c in the tent that night. I didn’t sleep much, a norm for me, and had plenty of time to ponder the Big Agnes gear. First the Insulated Air Core mat. I liked, it worked, it was comfy and it packed well. If I was in the market again, then I’d certainly put it on the list of options. Not as warm as my older model Synmat but I’d have bailed that night if it hadn’t been up to it’s rating, a decent piece of night time insulation. Next the Encampment. I was happy it was synthetic, the poor thing was rather wet in the morning. Soaked in fact and mostly at the head, due to the condensation that the Vango managed to produce, or was that me? I’m blaming the tent, hideously small and it wouldn’t have happened in my Comp. A down bag would have had me running for the van, somehow the Encampment managed to hold onto the tiny amount of heat I’d given it to play with. I was proper cold, my fault for ignoring ‘the regime’ and the night was long. The pillow sleeve was ace, the best I’ve ever used in fact and that was with wrinkly Proshell in there and not fleece. The space inside probably didn’t help with heat retention but then I’d not brought any heat into the Encampment to start with. The zips worked gratifyingly easy and the mat stayed put underneath. I’m not going to say I had good night’s sleep because I had very little. Was I warm enough? I’m was as cold as a freeze pop. However, I happened to be exceedingly comfy and in my own tent, with food in my belly and after a hard days walk – the Encampment and the Insulated Air Core would have made for a grand place to be. The pair come in at about 2200g, a quick hunt on the interweb finds them to be reasonable in terms of pricing and I’ve never slept in a bag quite like it. It’s plusher than other top bags I’ve fondled and during those long hours, I started to wonder why they haven’t made an eVent skinned version. Who’d need a bivy bag or tent then? 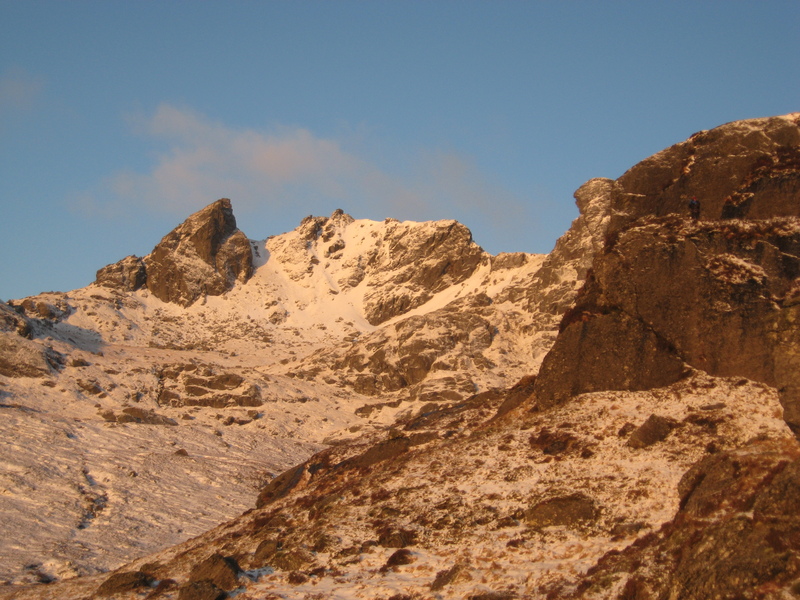 An idiot camper, a tiny tent I’m still shocked by and a Scottish winter – Big Agnes got me through the night. Thank goodness it was synthetic, cheers Ollie. Montura Yaru North Pants – a review of TROUSERS! It’s always the same – too much beer, wake up late, disorganized but this time, I’m in luck as the protagonist of the weekend’s play was a certain Pete AKA ptc*. A man well known for his colourful clothing and late starts. Sure enough I still managed to make it to the meet up point well ahead of Pete but many, many minutes after the rest and first dibs on all the gear that was to be tested had long passed by the time I parked up. John from Ardblair had a cavernous boot full of gear, Leki poles, Hillsound crampons, X-Bionic and the not yet on sale here – Montura. From time to time, this brand gets mentioned on UKC and seems to have a great rep amongst the many alpinists on those forums, often when someone is after a fairly technical piece of kit. Ollie from 9point9 was similarly encumbered with high quality gear from Big Agnes, Granite Gear and Princeton Tec… this was gear heaven and a man’s head could explode! Life has often taught that there’s a price to be paid for a lack of punctuality and sure enough most of the kit had been dished out to the eager beavers who didn’t have a hangover, I said hello to everyone whilst my head was falling to bits and it was great to catch up with Sandy who I haven’t seen in a while. Most people had a fetching shade of green on their upper body, Montura like green it seems, and all of the various shells, soft and hard, had a temporary owner. No worries, I love my Berghaus Temperance, in it’s lovely shade of yellow and with the weather looking a little grim, I’d appreciate it’s ‘best bar none’ (IMO) hood at some point. That was when John asked my waist size. So it came to pass that I became the short term possessor of the latest cut of Montura’s Yaru pants – the North. In bright red, yes, BRIGHT red. Fabulous, they’d go well with yellow Berghaus and I could spend 48hrs looking like a long lost refugee from Sundissential. All those years going to Sundissential dance events and I’d always avoided the red and yellow colour clash, yet finally, I’d succumbed to a man called John and his bright red pants. There was no looking at the features, asking questions or having a choice. They fitted, that was that. In a Medium and I was chuffed – ‘less of the fat lads’. So I wore them without having a look at them, apologised to passers by for damaging their retinas and slowly came to like my new Yaru trousers. The waist belt did up oddly in a very european stylee, just hoick up the very thin zip and tuck a small velcroed tab across. By tiny, I mean maybe less than 20mm and I wasn’t impressed with not having a button. More on that later. Nice zipped pockets in the right places, some zips at the bottom of the calves and these Yarus were rather a fitted garment on the lower leg. Much like some red jeans I had circa 1982, jeans that left me with stretch marks on my lower back they were that tight. These Montura’s were a brief reminder of new wave days gone past but that’s were any similarity ended. 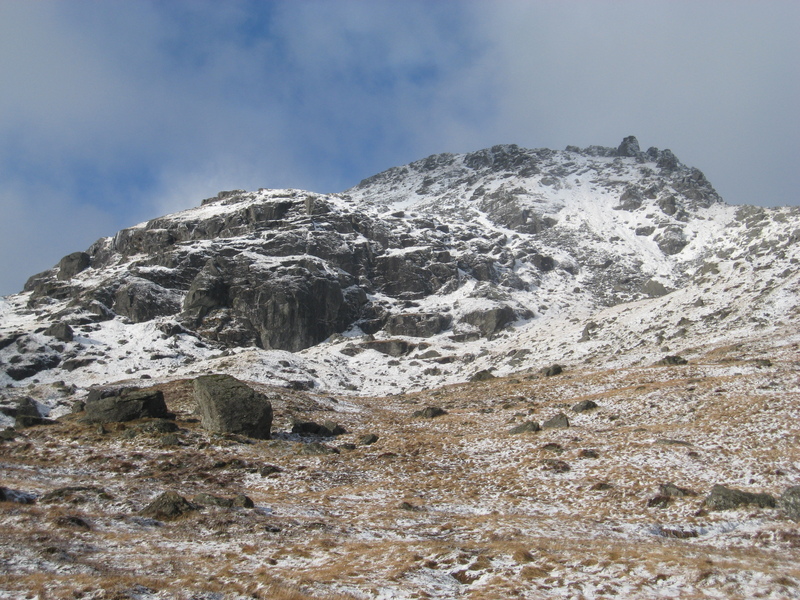 The material was cracking, a proper four way stretch, good wind resistance, snow shedding and some decent patches of a toughened material on the knees for the scramblers and climbers. I felt like an Italian guide on the Monta Rosa, swarve, sophisticated… then I’d hear someone whisper, “look at him – blimey”, there was no hiding from the red and yellow. That waist belt bit of velcro and thin zip just wasn’t an issue, it worked and I didn’t notice it apart from when I put the trousers on. In fact, apart from the colour, I didn’t notice the trousers at all that weekend. Fit is everything and I dare say, if they hadn’t been the right fit for me I’d have had a miserable time in them. They stretched the right way, there was no wind noise due to flapping material and I was a happy man. I could grow to like these. Expensive no doubt but I could be persuaded to part with hard earned cash for these and I kept trying to find reasons not to want them. As they were so fitted on the lower leg, I just couldn’t imagine wearing my B3 boots with them (red of course!) without a gaiter and that would have been a shame, an unnecessary extra item of clothing. Speaking with John on Sunday’s saunter back down to the car park, it transpired that the trousers were about 145 euros, if my memory serves me well and in my head I’d been thinking about £130 anyway. 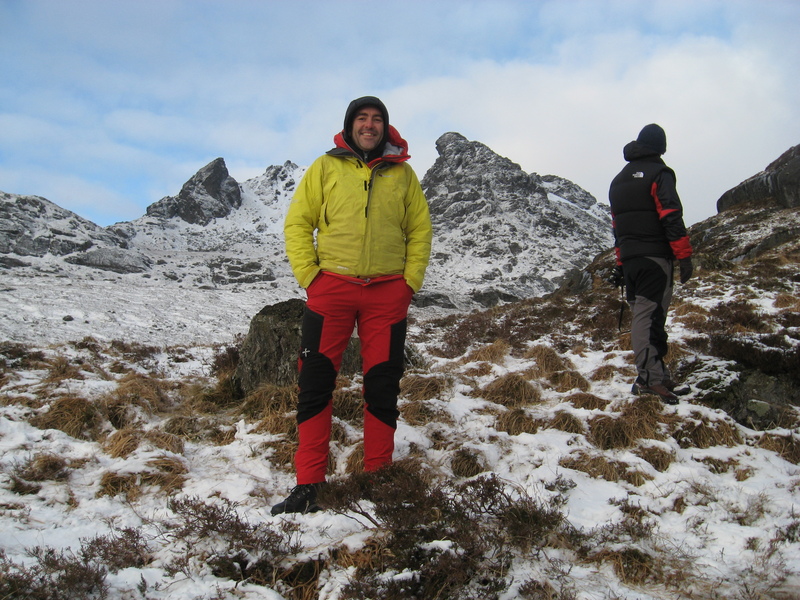 Simple, well designed winter/alpine trousers… except they weren’t that simple. Once I’d taken them off to return them to John, I had a good look at what I’d been wearing. The discreet zips down by the calves hid an inbuilt gaiter, which had the most amazingly designed elasticated adjustment. B3 wearing and these trousers was on and further investigation of the Montura’s design showed them to be worth every euro of the proposed cost for next winter’s new line. I wanted them. Someone make me happy and stock the Montura range… or buy me a flight to the Italian Alps next winter. You know it makes sense.